Heljarchen Hall is a piece of property in the Pale, north of Loreius Farm and south of Fort Dunstad. It is one of three potential homes available with the Hearthfire add-on. After installing Hearthfire, you may purchase this plot of land at The White Hall in Dawnstar. If Skald is still the jarl, speak with him; if Skald won't sell you the land, speak to Bulfrek; if the Imperial Legion has control of the hold, speak with the new jarl, Brina Merilis. You will have to complete the quests Waking Nightmare and Kill the Giant before being allowed to purchase land if Skald is jarl; Brina will allow you to purchase land out of gratitude for your help in installing her. When you ask if you can buy a house in the hold, you will be told that there are no houses for sale at that time, but a new plot of land is available. It will cost 5,000 gold. 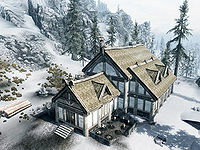 Your new property, Heljarchen Hall, will be marked as an undiscovered location on your map, located on the southern border of The Pale, where the northern mountains give way to the great plains of Whiterun Hold. The property is southeast of the Tower of Mzark; a short distance to the east is the giant camp Blizzard Rest, and you can see Dragonsreach rising behind Loreius Farm to the south. It is also located almost directly over the central ruin in Blackreach. When you arrive on your new plot of land, you will find a drafting table, carpenter's bench, anvil, and chest on the outcropping on the south edge of the property; a stone quarry is a few feet beyond the chest to the south, in the outcropping itself. The "Log Pile" is on the western border, and there are two clay deposits; one is south of the log pile, next to the wood chopping block, and the other is just a few feet south of the stone quarry. You can begin building your home immediately, with materials provided in the chest when you first arrive. A unique feature at Heljarchen Hall is you have the option to build a grain mill. Once built, the grain mill will appear along the house's western wall. It can be used to convert wheat into a sack of flour. The hall's entrance will face Dragonsreach once construction begins, and standing on its steps will offer an impressive view of the Throat of the World. Like the other player-built homes, you will have the option to expand onto your home with a Main Hall, cellar, and three wing additions. See this page for a list of pages detailing the furnishing options in each part of your home. Should you become a Thane of the Pale, Gregor will become your housecarl. 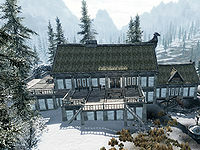 He will move to Heljarchen Hall upon construction of the small house layout. Build Your Own Home: Construct a house for yourself. Waking Nightmare: Relieve the people of Dawnstar from Vaermina's curse. The house may be named after Helarchen Creek, a settlement located roughly near the area, which appeared in TES I: Arena. It may also derive its name from Heljarchen, a village in The Pale that was originally planned to be in the game but only exists as Nightgate Inn in the finished game. Fine, love. I think the fresh air does wonders for all of us, and this house... it's just perfect. Esta página foi modificada pela última vez à(s) 02h45min de 29 de maio de 2015.